Alpha A3 Drill Comparison Chart. 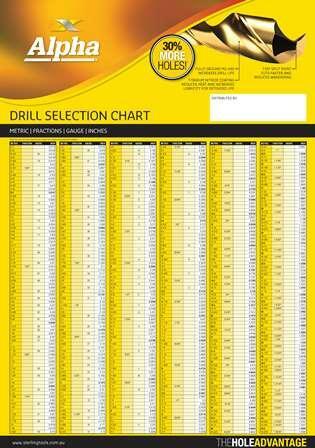 This easy to use chart allows you to directly compare Metric, Fraction, Gauge and Inch drill sizes. You can download the pdf file , or alternatively send us an email via the CONTACT page, and we will send you a printed A3 poster for free.